Peter Bryer: Mobile Foresight: Complimentary complementary access. U.S. cable operators share their WiFi efforts. Is this a new wireless network? Complimentary complementary access. U.S. cable operators share their WiFi efforts. Is this a new wireless network? Back in the year 2004, around the time voice was still the killer app on most shiny new 3G networks, the term "complementary access" was being used in some wireless circles. The term meant WiFi access points that filled in the occasional cellular coverage gaps. As WiFi-capable handsets began infiltrating the enterprise handset market, it was clear that WLANs would become an integral element of most wireless networks. But the dirty little secret that most everyone knew at the time was that a point in time would be reached when the roles would be reversed: cellular access would become the complement to WiFi. It was a tough notion to swallow for operators who spent billions bidding in the 3G spectrum feeding frenzy. I've read in a number of places that the majority of wireless subscribers in developed markets are covered by a "friendly" WiFi access point 80% of the time, be home, office, or at the coffee shop. In the U.S., free WiFi has become a near requirement at restaurants, malls, supermarkets, and home improvement mega stores. What was once considered complementary access has now become complimentary access driving the role reversal further. The U.S. market especially enables WiFi-centric behavior. You see, the U.S. is cable country, with almost 70% of American households subscribing to a cable service. But because most cable operators lack the spectrum to offer the same trible- and quad-play services as their cellular-packing competitors, they have turned to poor-man 4G spectrum: WiFi (both indoor and outdoor). Regional cable operators in the U.S. have really offered nearly superb WiFi coverage at no additional charge to their subscribers (usually limited to around five devices based on MAC addresses). Busy bus stops, and popular night spots, your local cable operator probably has you covered. You can even find signals on some busy highways. But the keyword has regional. Travel a few states away, and that zappy complimentary connection is no where to be found. Until now: five of the larger American cable operators have just announced a sort of WiFi roaming agreement between them providing common access to subscribers of any of the five. As over-the-top services such as Facebook and Skype are beginning to dilute the cellular hold on identity, and even traditional cellular operators are looking to WiFi access points to free more valuable spectrum, it's time to recognize the role reversal and welcome WiFi networks to the adults table. Implications: For internet services and app developers, it's important to acknowledge this new type of mobility that will chunky coverage gaps and recognize WiFi-only tablets and iPods as true mobility devices. A bold move by the American cable operators: WiFi is the new cellular. 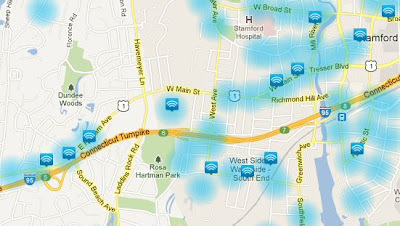 feeling blue: Cable's WiFi coverage along a highway of a New York suburb.